Pompeo Batoni was the son of a goldsmith with whom he first learned to draw. He subsequently trained as a painter with two local artists: Domenico Brugieri and Giovan Domenico Lombarda, then moved to Rome at the age of nineteen to complete his studies. Batoni lived and worked in Rome for the rest of his life and became a celebrated portraitist. He frequently depicted British sitters on the Grand Tour, presenting them in an elegant fashion surrounded by classical ruins in works that not only offered a record of their travels but also reflected their artistic interests. Batoni also executed history paintings in addition to portraiture, a field in he was particularly well known and appreciated and to which he devoted most of his efforts in the 1750s. One of his first commissions in Rome was an altarpiece of the Virgin and Child with four Saints for the church of San Gregorio al Celio. Batoni made a profound study of the great 16th- and 17th-century masters such as Raphael, Guercino and Reni and their influence on his work is evident. He also made drawings of classical sculpture which he sold, and included depictions of sculptures and fragments of classical architecture in his paintings. The present portrait is signed and dated 1785 and falls within the artist’s late period. The sitter’s identity is known from the inscription in italic script below the artist’s signature. 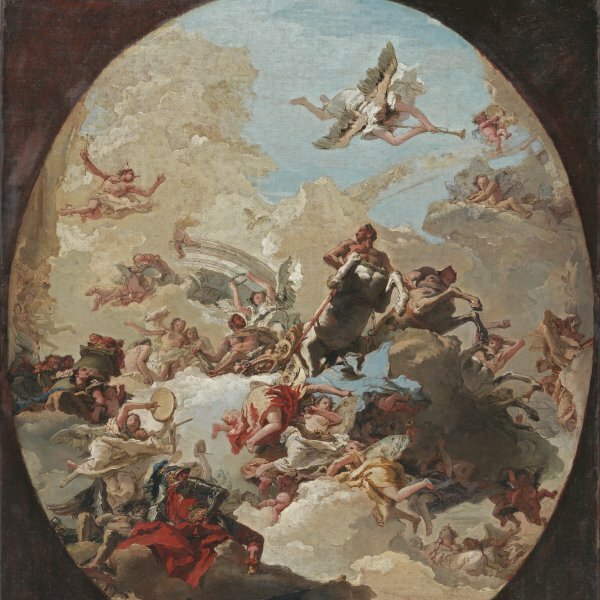 The canvas, which was recorded in Rome in the possession of the Countess’ descendents, was later in the collection of the architect Andrea Busiri Vici, where it was to be found in 1964 when it was included in a monographic exhibition on Batoni held in Lucca. In 1973 it was in Munich and four years later entered the Thyssen-Bornemisza collection. It was displayed on the principal staircase of Daylesford House, the residence of the Baron and Baroness in the UK. Batoni depicted the Countess seated in a dark interior. The only classical references are the objects such as the table with a red cushion on top and the tazza balanced on its near edge. The image is highly appealing due the contrasting colour range used for the Countess’ dress, which is painted in a lively blue with a delicate range of silver tones. The Countess is depicted with bright, lively eyes, a low-cut dress and an elaborate and sophisticated hairstyle. Her high, abundant hair is decorated with pearls, a blue ornament that matches her dress, and a small cluster of roses. 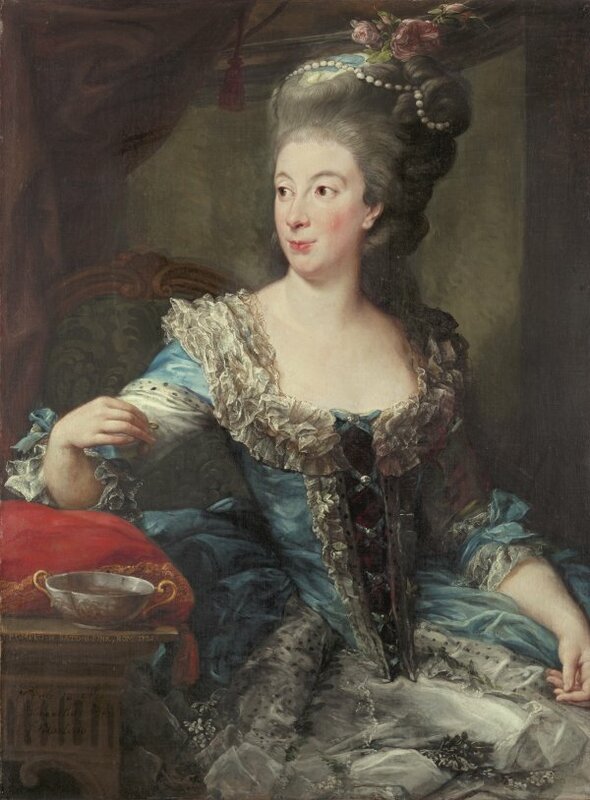 The sitter’s pose, the setting and the hairstyle have been compared to those to be seen in another late portrait by Batoni of the Marchioness Barbara Durazzo Brignole of 1786.